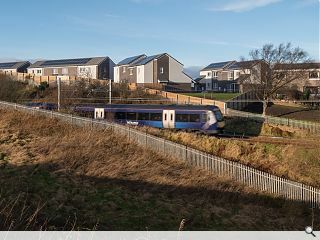 Timber construction specialist’s CCG have completed work on a small social housing development in the Tamfourhill area of Falkirk in partnership with Weslo Housing Management. Carrick Place consists of 16 one and two-bedroom cottage flats and three semi-detached houses all of which have been allotted for social rent. 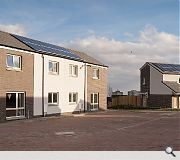 Mike Bruce, Chief Executive of Weslo, said: “After 9 years of actively trying to get some much-needed social housing on this area of land, we are absolutely thrilled to see the houses complete and the new tenants so happy with their new homes. Each property was assembled using CCG’s closed panel timber frame system following manufacture at an off-site facility, bringing the build time down to just 40 weeks. What an atrocity. I can only presume there was no architect involved? To consider the failure that is post war council housing a timeless classic and then to go forth and replicate it is truly baffling. Let me try to be a bit more positive...16 much needed housing units for social rent, that's good. Build time down to 40 weeks, that's seems good. Solar panels and reduced energy costs, also very good. The main problem is obviously the visual element and why we find it so hard to build more stylish housing that adds to our townscapes. Will the new Scottish planning proposals due to be introduced in 2018 significantly improve that situation? I get a bit depressed at so many comments on this website, such as the one from "Philip". Is the problem simply one of cost? Having said that the public realm looks rather poor. Lots of undifferentiated brindle block paving, all a bit bare. "Daddy where were you the day post-post-modernism jumped the shark?" 1. I am absolutely delighted with my new home and can't believe my luck!! The estate is well done and the view is amazing, can see the Wallace monument from the back garden from the minute you walk through the front door into the spacious hallway, you get a really homely feel. Thanks to a well-equipped modern kitchen and utility room, meal time is family time again. I have never known a new build to have such great storage space and power sockets galore, it really is the cosiest home and so energy efficient to keep the bills to a minimum. My new house has surpassed all my expectations and I am enjoying living here so much. 2. I am currently residing at Carrick Place Tamfourhill. I cannot say how pleased I am with my new home, I have settled in instantly and feel this is due to the excellent quality and finish of this development, every room is finished to high standards, the bathroom and kitchen fittings in particular, the lay out of the communal parking area has been well thought out and there is ample parking for all the residents. I feel extremely lucky to be given a property in this development. I have been with Weslo now for nearly two years and cannot fault them as a housing association and would highly recommend them. 3. We now have a brand new flat with no stairs, our own garden with patio door access which my son is happy about as he can now play freely and I have the added reassurance he is safe as I can see him at all times. I also really like the way it's been decorated with modern kitchen and toilet and the attention to detail is perfect. I have my own car park space and the access road is quiet with only residential traffic which is helpful too as my son has no sense of danger. I love my new flat and so does my son. 4. We absolutely love our new home. It has been so well thought out and laid out. The estate is so lovely and offers plenty of parking for each property and to top it off the views at the rear of our house is stunning. Well done Weslo we love it. just thought I'd add a bit of balance to some of the views expressed so far. all you fancy architects are missing the larger issue. 9 years! 9 Years to deliver this junk!! Pretty sure that most folk moving into these houses will be delighted with them and wine loose to much sleep over your middle class, wine drinking snobby comments about design. But 9 years!! When this project started George Bush was President. Shame on all involved in deliverying this project. Big Boy, its clear to me you have no idea. Read Mike's post then read it again. These tenants are happy and that's a good thing. As for all architects being middle class......really? I assume you support Trump! It is ironic given the plethora of Placemaking direction and guidance available, that in 2017, the best we can come up with is this. AD+S should be forced to do an audit here instead of continuing to harp on about atypically funded schemes such as Polnoon or the Drum. Really enjoyed the condescending article in response to these comments from Mike, takes the throw away comments and completely misses the issue of very poor design and detailing for the location, thinking people are commenting on aesthetics. C'mon Mike, we all know the complexities of delivering affordable or social housing but take a long look at what you have produced here. It's absolutely joyless with poor detailing which will prematurely age the building. It may be a success from your point of view because a tenant has said it's better than some other bit of poor housing they've been in and because it's new, give it 3-5 years when all that render is going green, the hard landscaping has has stained the base course and the featureless monoblock desert has settled - then take a new tenants thoughts! This is a poor example of the typology, no matter how you frame it. It was also a little unfair to pick up your comment regarding a 'free' house. The reality of Weslo's situation is that they are paid 46% of their rental income directly by the government (at least they were as of March 2016. So whilst it may be true certain residents don't get a 'free' house, it's equally true to say on average almost all of their tenants get half of their house for free. Or, if you like it round the other way, 60% of those who get their rent paid directly to Weslo (1420 or their 2352 tenants) are getting, by in large, a 'free' house. It might not be in this particular scheme, but that rather misses the point. No doubt this will be picked over and rebutted, but hey ho as long as 18 people are happy to hell with the rest of us funding, at least partially, their happiness.